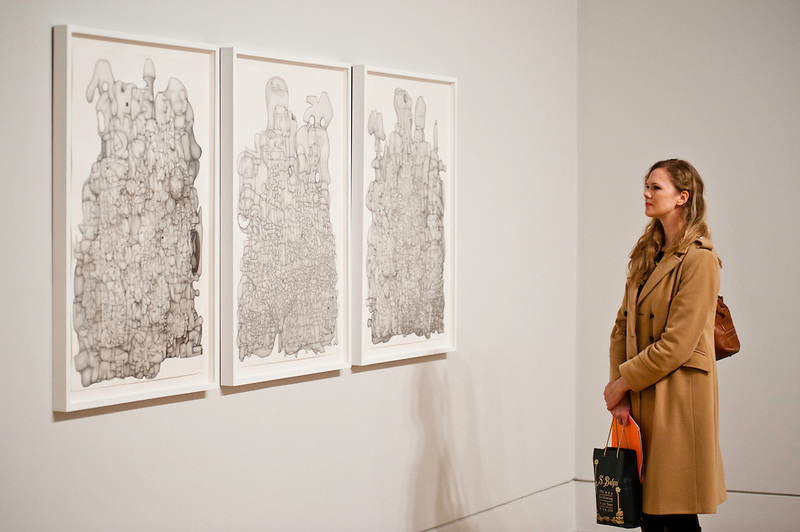 London, UK - 1 october 2012: a woman looks at a piece of work by nominee Paul Noble during the Turner Prize 2012 press preview at the Tate Britain. The exhibition features work by four shortlisted artists: Spartacus Chetwynd, Luke Fowler, Paul Noble and Elizabeth Price. The winner of the prize will be announced during a live broadcast of the award ceremony on Channel 4 on the evening of Monday 3 December 2012. The exhibition is open from 2 October 2012 to 6 January 2012. Images are available for sale here, on Barcroft Media, Alamy, Demotix, Press Association and Corbis. 2012 Elizabeth Price Luke Fowler Paul Noble Spartacus Chetwynd art art gallery autumn britain contemporary art exhibition gallery london pimlico press preview prize show tate turner uk reportage photo reportage photo reporter features reportage photography reportage photographer documentary photographer documentary photography editorial reportage photographs photographs image images picture pictures photo photos project photoproject photo project photograph photographs event photographer event photography events photographer events photography event photographer london events photographer london press photographer london press photography london press photographer news photographer fotografo a milano fotografo milano fotografo milano centro fotografo lombardia fotografo "milan photographer" "photographer in milan" "photographer in bergamo" "photographer milan" "photographer milano" "photographer in milano" "italian photographer" "photographer in italy" "photographer in lombardy" "fotografo a como" "fotografo a pavia" "fotografo a bergamo" "fotografo a trieste" "photographer trieste" "fotografo di milano" "fotografo a milano" "photojournalist in milan" "corporate photographer" "event photographer" "fotografo di eventi" "fotografo di eventi milano" "photographer in bergamo" "photographer in trieste" "event photographer milan" "milan photographer"